Textron AirLand, LLC and Beechcraft Defense Company, both Textron Inc. (NYSE:TXT) companies, recently hosted student pilots from the U.S. Air Force Test Pilot School at Textron Aviation‘s Wichita, Kansas facilities to evaluate capabilities of the Scorpion ISR/strike jet and Beechcraft AT-6 light attack aircraft as part of the school’s Capstone Project. Five students and three instructors from the Test Pilot School spent a week in Wichita with teams from Textron AirLand and Beechcraft for the school’s project – to evaluate a new production/prototype aircraft with a set list of criteria. The student pilots participated in both classroom and cockpit ground training, as well as in preparatory and evaluation flights. A total of 19 flights were successfully completed in four days – 12 demos on the Scorpion and seven on the AT-6. Scorpion completed three flights daily during the four day event – delivering 100% aircraft availability and 100% mission accomplishment. After each flight, Scorpion rapidly returned to the air, with an average aircraft turn time of 31 minutes, and a best turn time of 20 minutes. The AT-6 also turned in an excellent performance for its seven flights, with 100% aircraft availability and 100% mission accomplishment. “It was an honor to collaborate with the USAF Test Pilot School on the project, and our team also learned a lot by completing so many flights in such a short span,” said Bill Anderson, president, Textron AirLand. Soon after completing the event, Scorpion’s own test pilots were back in the aircraft, self-deploying from Wichita to South America for additional demo flights requested by a foreign air force. Scorpion returned to Wichita on May 5th after completing its 10 day, 6,627 nm round-trip, international journey. During the trip, Scorpion completed 17 sorties, added 28.1 hours to the plane, and executed six demo flights (four on the first day) for a prospective Air Force customer. The flights achieved 100% mission availability and 100% mission accomplishment. Along the way, Scorpion participated in two static display events in Florida (SOUTHCOM in Miami and CENTCOM in Tampa) – also without the need for additional support aircraft or personnel. Textron AirLand’s ScorpionTM Jet was introduced in 2013 and has completed several hundred hours of flight testing with an exceptionally high mission availability score. Scorpion is a highly affordable, multi-mission aircraft offering diverse capabilities including intelligence, surveillance and reconnaissance, humanitarian assistance, disaster relief, advanced training and precision strike. Aircraft features include twin-engine power, two-seat operation, large internal payload capacity, high-definition ISR cameras, wing-mounted weapons stations, modern avionics, all-composite structure and more. For further specifications and flight videos, please visit www.ScorpionJet.com. The Beechcraft AT-6 is a multi-role, multi-mission aircraft system designed to meet the spectrum of needs for the light attack mission. Leveraging a range of highly-specialized, but off-the-shelf capabilities, the AT-6 is outfitted with state-of-the-art equipment such as Pratt and Whitney PT6A-68D engine, CMC Esterline’s mission modified Cockpit 4000, Lockheed Martin’s A-10C-based mission system and L-3 WESCAM’s MX-15Di sensor suite. The aircraft has successfully demonstrated high-end net-centric and light attack capabilities and is fully compatible with U.S. and NATO Joint Terminal Attack Controller systems. 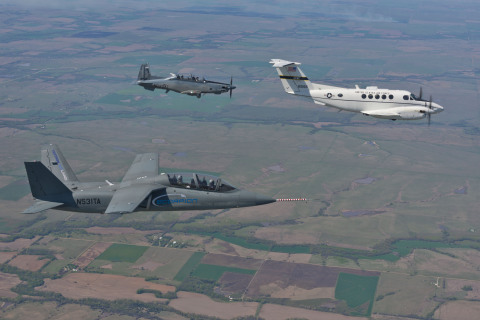 About Textron AirLand, LLC Textron AirLand has developed a highly affordable and exportable twin-engine ISR/Strike/Trainer jet for the tactical military aviation market. A versatile jet platform based on commercial best practices and proven high technologies, Scorpion is designed as a multi-mission aircraft for diverse battlefield, security and training missions. More information about our initial aircraft is available at www.ScorpionJet.com. Certain statements in this press release are forward-looking statements which may project revenues or describe strategies, goals, outlook or other non-historical matters; these statements speak only as of the date on which they are made, and we undertake no obligation to update or revise any forward-looking statements. These statements are subject to known and unknown risks, uncertainties, and other factors that may cause our actual results to differ materially from those expressed or implied by such forward-looking statements, including, but not limited to, the efficacy of research and development investments to develop new products or unanticipated expenses in connection with the launching of significant new products or programs; the timing of our new product launches or certifications of our new aircraft products; our ability to keep pace with our competitors in the introduction of new products and upgrades with features and technologies desired by our customers; changes in foreign military funding priorities or budget constraints and determinations; changes in government regulations or policies on the export and import of military products; volatility in the global economy or changes in worldwide political conditions that adversely impact demand for our products; performance issues with key suppliers or subcontractors; and continued demand softness or volatility in the markets in which we do business.